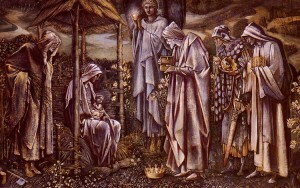 Central idea: The Epiphany reveals that salvation is for all peoples. Doctrine: The Church, sacrament of human unity. Practical application: Growing in human unity. To view Lectionary 20, click here. In Isaiah’s vision, the earth is covered in darkness but God’s glorious light shines on Jerusalem. People from every race and nation—even their kings—joyfully flock to Israel bearing gifts. The Chosen People who have been exiled from the Promised Land return. Everyone is drawn to Jerusalem because the radiance of God’s favor rests on her. This prophecy is realized in Jesus Christ, God’s anointed savior, and his Church, the New Israel made up of Jews and Gentiles. A first fulfillment is seen in the homage the pagan magi render to the infant Jesus. We are in the time of a fuller fulfillment as the Church’s missionary activity brings Christ’s salvation to the ends of the earth. The prophesy will be definitively fulfilled at the end of time when Christ comes in glory. In Christ, God is calling together the one human race to acknowledge and serve him in holiness. All peoples are to lay their treasures at his feet. When this everlasting regime is established, then every nation on earth will adore him. The Church, his body on earth, in imitation of her head, never forgets the lowly and the poor, whether the privation is material or spiritual. God’s revelation is entrusted to the apostles and their successors. God’s grace is dispensed through the Sacraments. God’s salvation is for everyone: the Gospel is as much for the Gentiles as for the Jews. These magi understood the Christ child to be the king of the Jews. Learned Jews testified that this messiah would be sent by God to shepherd and rule Israel. As Peter would say to the upright and God-fearing pagan, Cornelius, “God shows no partiality, but in every nation any one who fears him and does what is right is acceptable to him” (Acts 10:34-35). These pagan magi were acceptable to God because they feared God and did what was right. They were led by God’s power to Christ and brought gifts to him and his family—to Mary and Joseph—as Isaiah and the psalmist foresaw. Even though we are not pagans but members of God’s family through Baptism, we too bring our gifts, whatever they are, and lay them at the feet of Christ and his family, the Church. We do this out of gratitude, because of the good that God has done for us. And we bring our gifts in a spirit of service for anyone in need. As the Psalmist foresaw, “he shall rescue the poor when he cries out, and the afflicted when he has no one to help him. He shall have pity for the lowly and the poor; the lives of the poor he shall save. Christ gives to the world what the world needs but he gives it through human instruments. We are those instruments. The Church is the sacrament of human unity. This means the Church is both a sign of human unity and the means by which this unity is realized. This unity is the community or communion or friendship or fellowship or family or even marriage among the human beings joined to Christ through his Church. CCC 775 speaks of a double but interrelated unity. Each of us has a part to play in this unity. First is our “inner union . . . with God.” We really can meet God each day by reading and meditating on the Sacred Scriptures and by the reception of Holy Communion. As Pope Francis put it, “I invite all Christians, everywhere, at this very moment, to a renewed personal encounter with Jesus Christ, or at least an openness to letting him encounter them; I ask all of you to do this unfailingly each day. No one should think that this invitation is not meant for him or her, since ‘no one is excluded from the joy brought by the Lord.’” (“Love is Our Mission” catechesis for the World Meeting of Families, September 2015). Second is our union with all other persons through friendship and apostolate. Like the magi who brought their gifts to the Christ Child or the people from the ends of the earth who will bring their gifts to Jerusalem, we bring our gifts in service to our fellow man. Our inner union with God helps us to see what gifts we have to offer for others’ good and salvation. This inner union also motivates us to actually give them. The gifts we offer our fellow man are the gold, frankincense, and myrrh we lay at the cradle of Christ. Like St. Paul, we are stewards of God’s grace given for the benefit of others. The gifts we have to offer are everything good we might possess: goodness, beauty, truth, time, talents, treasures, physical strength, knowledge and understanding, courage, kindness, friendship, protection, life, correction, humor, weakness, vulnerability, suffering, work, craftsmanship, skill–and many others.